Overall ideas still on track with quick hitting snow expected overnight into early tomorrow morning. However, expecting less overall precipitation amounts and thus, less snow. Snowfall of 2" across the Piedmont still expected with amounts closer to 3" possible around Charlotte area and upper SC. So, not a major winter weather event in the scheme of things, but enough to cause early morning travel problems. Winter will be in full effect again this week as a major Nor'easter comes together Tuesday...primarily resulting in a cold rain followed by colder temps. Very strong winds on Wednesday expected with gusts as high as 40-50 mph range across the Piedmont. There is still a chance areas around / North of I-40 could see some sleet/snow mix in as the precip associated with the storm passes through Monday night into Tuesday morning. More details to follow if needed. Quick thoughts with more to follow tomorrow. Starting with a strong cold front passing overnight into Friday, we will see a rapid change back to winter like temps and a quick hitting snowstorm overnight Saturday into Sunday morning. 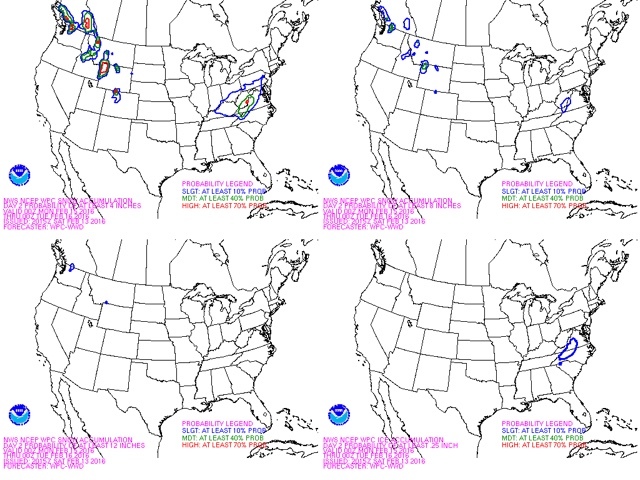 First guess on accumulations is in the 3-4" range across the NC Piedmont. Hard to believe after the early spring-like conditions over the past several weeks. As with any storm in NC there are a lot of different factors that will be at play and ultimately determine snowfall accumulations. (Again, 3-4" a safe bet across the area.) The energy that will become the "storm" is just approaching the West Coast so there are many details that will become clearer over the next 24 hours or so. The threat of winter weather continues into next week as well. Fear not, any flurries you see do not mean the storm has "started". No accumulation expected until after Midnight for majority of Piedmont. Worst case a heavier snow shower - while unlikely - could lead to a dusting at most. Main change to forecast thinking is onset time of precipitation should be about 12 hours sooner. Generally speaking snow should start falling approx midnight - 2AM. Models still struggling with some of the finer details so expect mixed messages from the NWS and local TV Mets. Reason being the low pressure track(s) which dictates timing of the warming is basically all over the place depending on which model one puts their faith in - as you can see in NWS map below which depicts potential low pressure locations and the big "L" is the official NWS guidance. Could be in Indiana or Alabama initially before going to the coast....but it doesn't really matter. Storms in NC chasing departing cold air rarely come out on the winter weather side. Rain will be the bulk of the precipitation for most areas except far NW Piedmont. So my model of choice is Penn Blanton's experience and I'll keep forecast as is for now and update tomorrow if there is need to. Only other note at the moment is that total accumulation could go up in Davie and points N and West a bit and ice (freezing rain) is still the main concern in the NW Piedmont. Just not seeing Rowan and points south having to deal with much more than I posted yesterday. All to be wiped away by rain in the end regardless. School is still out folks and work for most looks less likely given earlier start time of snow. I'll jump right to the point folks - we are looking at a "winter warm-up" storm to start the week with snowfall area wide beginning Monday AM, transitioning to sleet, then freezing rain, and ultimately all rain (temps above 32F) for everyone in the N.C. Piedmont. Yes, your typical "slop" of a storm, however, by Monday evening most locales shouldn't even have any travel problems or snow on the ground. Using (in my mind...) a Cabarrus-Rowan-Davie South to North axis as far as accumulations. Snowfall should begin approx 6-9 AM Monday all areas. Exact time TBD. Snow/Sleet, accumulating 1-3" South to North mixing with and changing to sleet around 10AM in southern areas as warm air moves north. 4PM Rain, temps above freezing, except Davie County which might be a few hours later, hence higher amounts of ice. No school Monday. Work, eh, depends on what you do and exact time snow starts. Fact = all snow that falls will stick as surface temps will be cold from the 48 hours of sub-freezing weather Friday night - Monday. As warm air moves in aloft the precip types will change as described above. We lack a parent high pressure system to the North for a classic cold air damming scenario, instead an "in-situ" damming event will occur. An in-situ wedge simply means the very dry (cold) air left from this weekend is our "source". It will take time to saturate and warm the air near the ground from about 10K feet down because at the start of storm the surface dew-point will be 10-15° F (AKA cold/dry) across the Piedmont. I'll put a map out sometime this weekend with an update if needed. Ciao.